Chicagoans demand "people's library hours"
CHICAGO – Mayor Rahm Emanuel was forced to back off his unilateral closure of neighborhood branch libraries on Mondays after the move sparked a public uproar. The city will restore half-day Monday afternoon library hours beginning in February.. However, widespread community support remains for restoration of full-day hours, which were cut as a result of the recent city budget agreement. 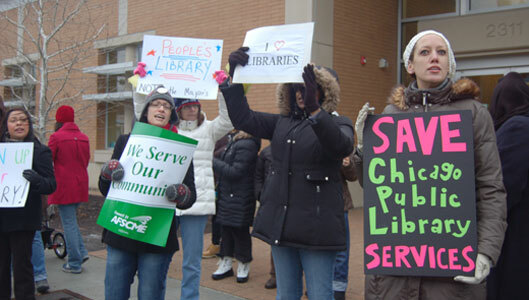 Librarians, community patrons and tots staged lively “People’s Library Hours” protests in front of three branch libraries on January 23. They demanded full funding for city libraries and recall of all laid off librarians. A steady blare of honks and cheers from passing motorists greeted the protests. “There are plenty of people who rely on the libraries on Monday mornings and we need the libraries open regular hours and fully staffed,” said Adrienne Alexander, AFSCME Council 31 policy and legislative specialist. Emanuel’s original city budget called for much deeper cuts. 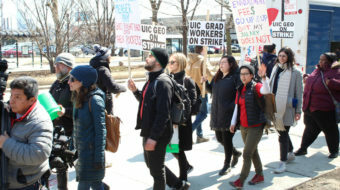 But public outrage fueled opposition in the City Council leading to a compromise of less cuts and shuttering branches for a half-day on Mondays and Fridays. The deal was contingent on an agreement with the library employees’ union, AFSCME. However, librarians balked, saying they wanted full restoration of eight-hour days and six-day weeks at branch libraries. On January 6 Emanuel, without consulting AFSCME, imposed a unilateral Monday closure. This was seen as an attempt to bully the union into an agreement. 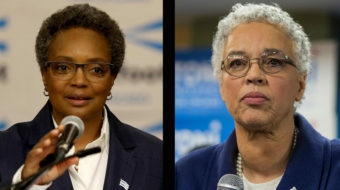 Library workers, many of whom earn $11 an hour and are among the lowest paid public workers, are being called upon by some of Emanuel’s leading council allies to forego scheduled 3.5 percent wage increases. However, the closures violated the contract between the union and city. Emanuel reversed course after taking a lot of public flack, and found $2 million to restore the half-day Monday hours. “Just two years ago libraries were open 64 hours a week. Mayor Daley reduced that to 48 hours due to layoffs. 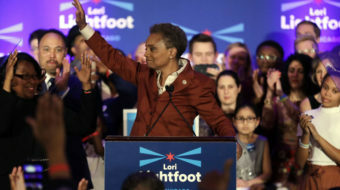 And now we have Mayor Emanuel pushing to go to 40 hours a week,” said Lindall. Library users want those closures prevented altogether, he said. Emanuel justified the cut in library hours based on decreased library usage. But according to Jeremy Kitchen, chief librarian at the Richard J. Daley Branch Library in the Bridgeport neighborhood, library usage has been cut because library hours have been cut. “When the libraries are closed people in the community have no place to better themselves. That’s our main mission and we want that for everyone. We’re passionate and committed about what we do,” he said. In addition to checkout of books and movies, Kitchen says they are places for people to access the Internet for job searches and to read newspapers. They serve as warming centers in the winter and places where students do their homework after school and children listen to stories. What galls many is while the city was cutting libraries and other services it eliminated the corporate “head tax” and cut $15 million in taxes for the Chicago Mercantile Exchange. 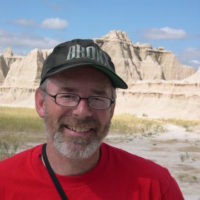 In addition it continues dispensing millions of Tax Increment Financing monies to a variety of corporations and developers, including $5 million to $6.5 million to the billion-dollar food conglomerate Sara Lee. At the same time Emanuel has said he will seek private funds to cover a portion of the anticipated $40 million to $65 million in expenses for the NATO and G8 summits the city will host this spring.